A Bahraini court Monday convicted in absentia the country’s top activist over alleged fake news on the situation of the country that he disseminated during televised interviews in January 2015. 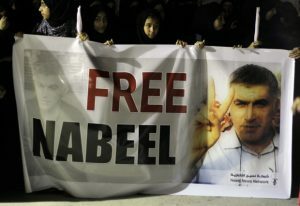 Nabeel Rajab who is currently in hospital was handed two-year jail sentence after authorities accused him of disseminating fake news, statements and rumors about the internal situation in Bahrain, that would undermine the country’s prestige and status, London-based The New Arab reports. Rajab has been placed at an interior ministry hospital since April for bad health condition and kept in confinement, Bahrain Institute for Rights and Democracy (BIRD) said. The man, known as one of the precursors of the Arab Spring in the tiny Sunni-led monarchy, has been in the eye of the storm for years. His condemnation drew outrage from right groups, which have called for immediate cancellation of the ruling arguing that Rajab only spoke the truth and was victim of the regime’s crackdown on criticism. “His lawyers state he was denied basic fair trial guarantees,” BIRD said in a statement, describing the sentence as outrageous. London-based Amnesty International (AI) joined its voice to condemnations noting that Rajab’s case exemplifies Bahrain authorities’ determination to muzzle truth speakers. 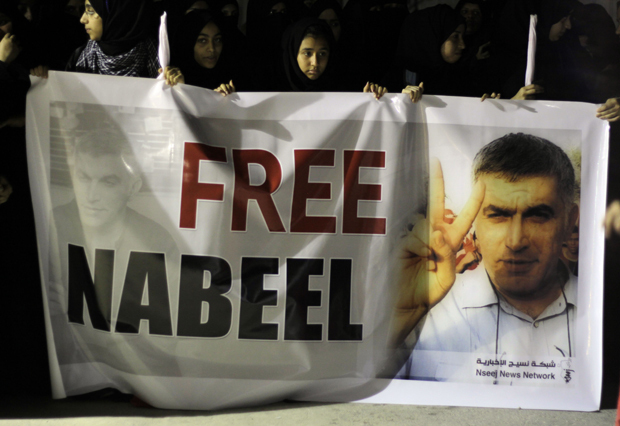 “Imprisoning Nabeel Rajab simply for sharing his opinion is a flagrant violation of human rights, and an alarming sign that the Bahraini authorities will go to any length to silence criticism,” said AI’s General Secretary Salil Shetty. “No one should be jailed for speaking out about human rights,” AI said. Rajab is expected to appear in court for another case in which authorities accuse him of criticizing in an article published in the New York Time and in a series of tweets the Saudi-led military campaign in Yemen involving Bahrain, The New Arab reports. The hearing is due on August 7, and if found guilty, 52-year old activist could face up to 15 years in prison, BIRD indicates. Written by: KanelkaTagba on July 11, 2017. Posted by KanelkaTagba on Jul 11 2017. Filed under Gulf News, Headlines. You can follow any responses to this entry through the RSS 2.0. Both comments and pings are currently closed.